On a Clear Day, You Can See Forever! My beautiful Mother-in-Law is visiting, yay! It’s been fun taking her around our area and sharing our forest with her. 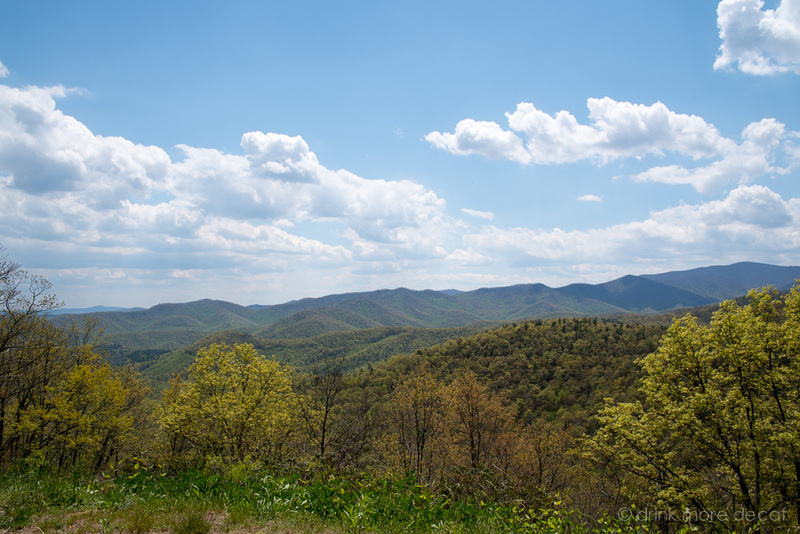 Today the weather was beautiful so we got to visit the Blue Ridge Parkway. Here we are at Chestnut Cove, elevation three thousand feet! Did I mention the weather was beautiful?! I’m so grateful to have this amazing woman in my life! This photo was screaming for a quote, it’s just perfect for one. But… I can’t think of one appropriate. So, it will have to just be quote-less. 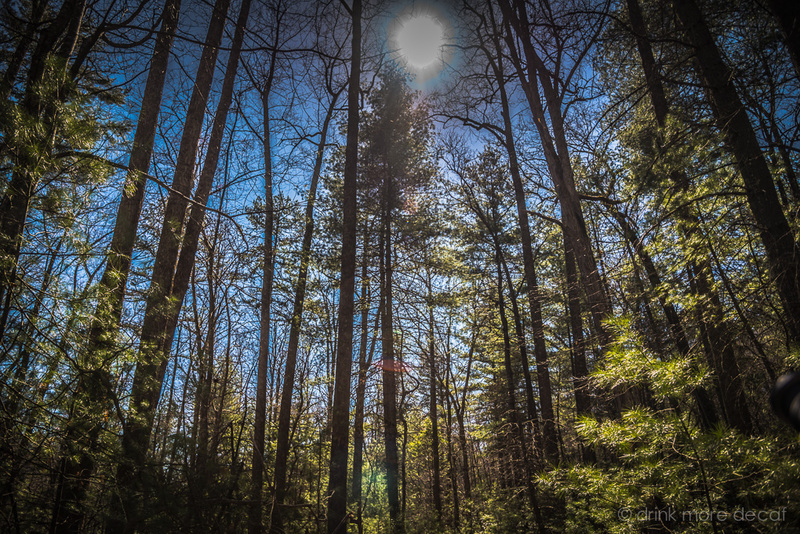 I had to take advantage of a rain-free day and get some nature shots. April is by far my least favorite month. At least it’s almost over! For years my husband has told me how amazing Brandon Sanderson is, but I hadn’t read any of his books until recently. We selected his book Warbreaker, as a book to read together – even though it was Dave’s second read-through. The story definitely lends itself to be read multiple times, so I can see why he chose it – aside from FINALLY introducing me to his favorite author! So finally, I get it! And yes, I agree, Brandon Sanderson is extremely creative. 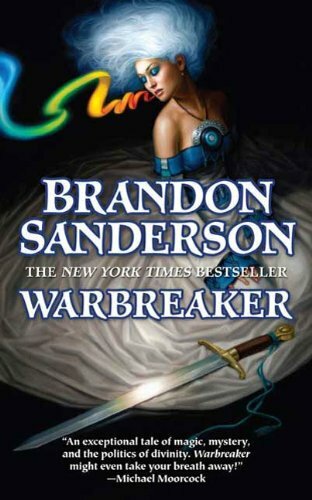 What makes Warbreaker so amazing, is the unique world-building and entirely original magic system Sanderson creates. The story itself is great… two sisters, one marries the God King they fear (who has never taken a living breath, so the fear is justified), and the other who… well, I don’t want to spoil anything. Let’s just say, the story is interesting and an enjoyable adventure. But the world? It’s captivating! Who would have thought of having a way to bring objects to life by way of using color, have a city and its inhabitants who views this as normal – and a warring city who views this as blasphemous, ostentatious, and vain. And, all the intricacies that go along with such a system… I’m not sure which I enjoyed more, the story, or the magic system upon which it was built. All in all, it may have been my first Brandon Sanderson book – but it won’t be my last! Lovely. But at least they look cool! Right? 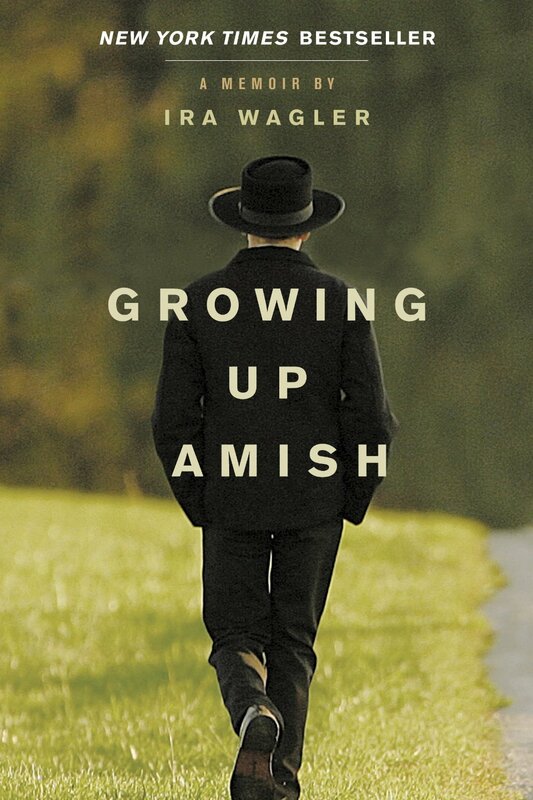 If you’re looking for insight into why Amish become ex-Amish, you won’t find it in this book, Growing Up Amish by Ira Wagler. Growing Up Amish by Ira Wagler is tedious to read. His memoir doesn’t shed any light on why he decided to become ex-Amish. Instead, you are carried through each exodus as though it’s a massive change in his life, and it would be, except that it’s temporary, and repetitive. He leaves – and returns – to the Amish four or five times. He finally decides to join the church, asks a young woman to marry him, courts her, and as the wedding time nears, breaks things off with her and leaves – AGAIN. Not long after he is out, he decides he doesn’t want to be excommunicated after all, and requests forgiveness and is accepted back into the Amish church – only to leave AGAIN. Once through about 75% of the book I couldn’t wait to finally be done with it. I hoped to have some answers about how or why he chose to leave the Amish once and for all, especially after the clear turmoil he went through with each decision-reversal, but that is not provided to the readers of his memoir. No, he simply leaves yet again, and the book ends with him back in the world. I’m slightly curious what made his final exodus “final” but I doubt he knows. He didn’t seem to know why he was so indecisive. If you’re interested in the ex-Amish, definitely check out the documentary “Amish: Out of Order” and skip this memoir. 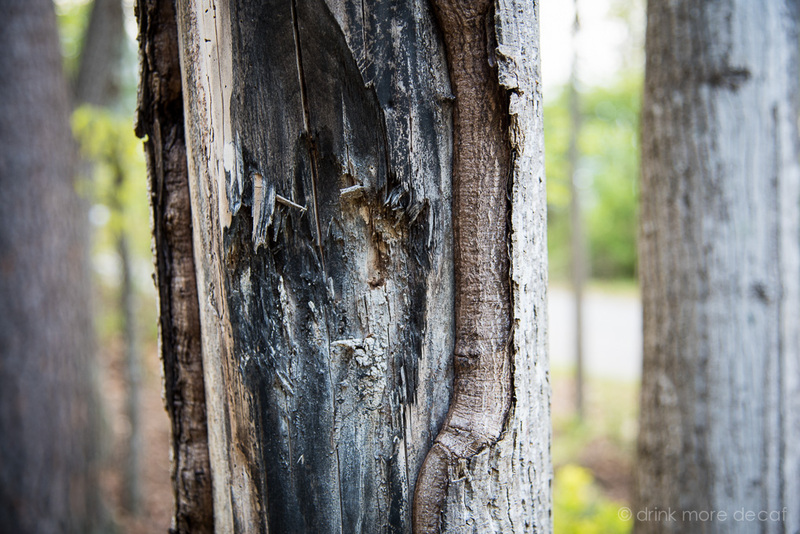 A tree of ours is healing itself from the outside-in! 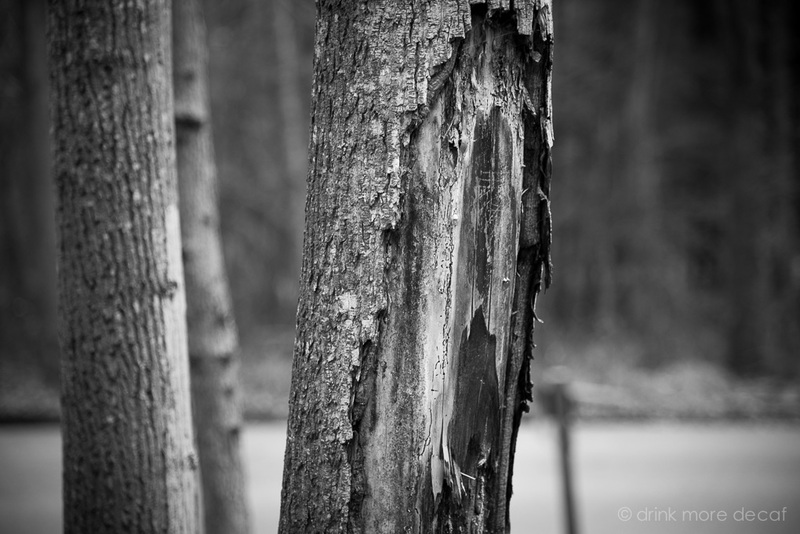 The tree callus is visible now, where it wasn’t just a few months ago. 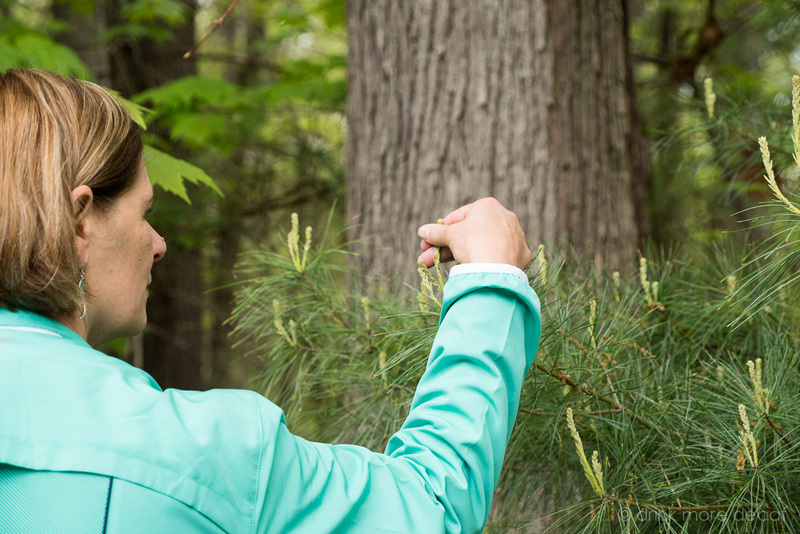 I never knew trees had self-healing properties, did you? Now, compare that photo, to the one below, taken today (April 2015). It’s only been a few months, isn’t that amazing! Trees are wonderful. 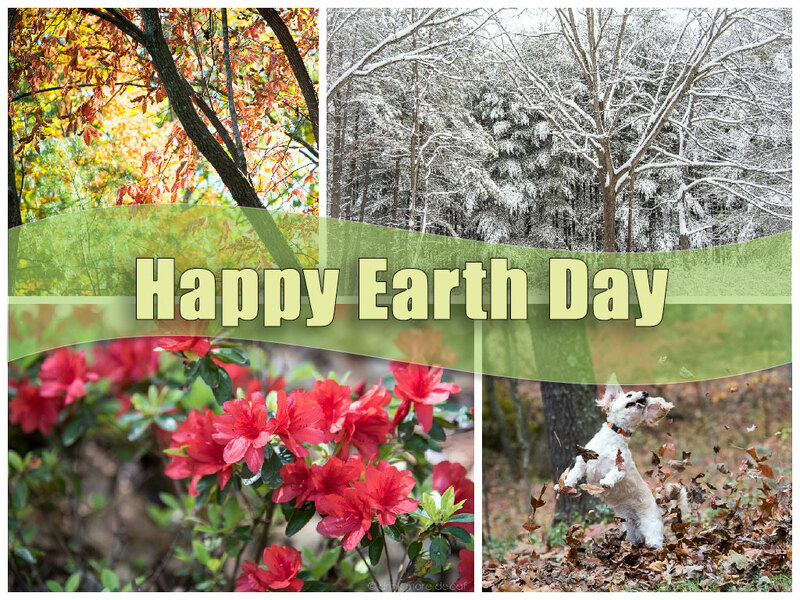 Happy Earth Day from our tree(s) to yours! 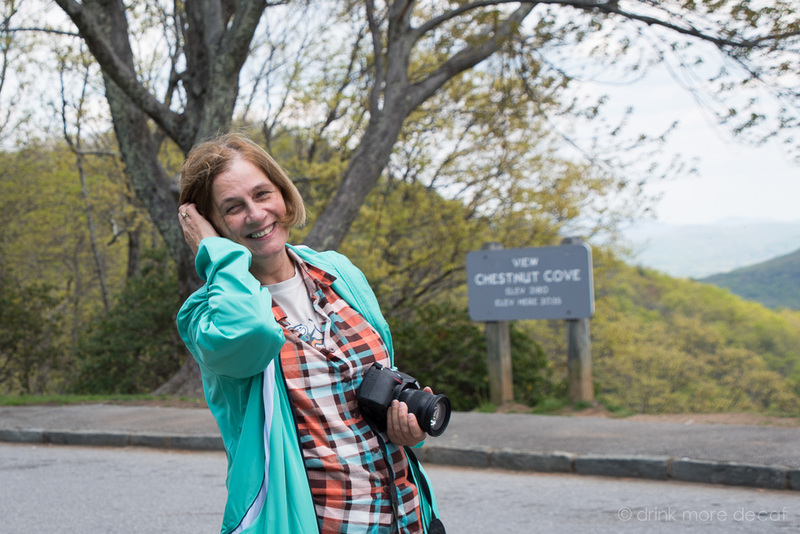 All photos above were taken in Asheville, North Carolina 2014-2015. 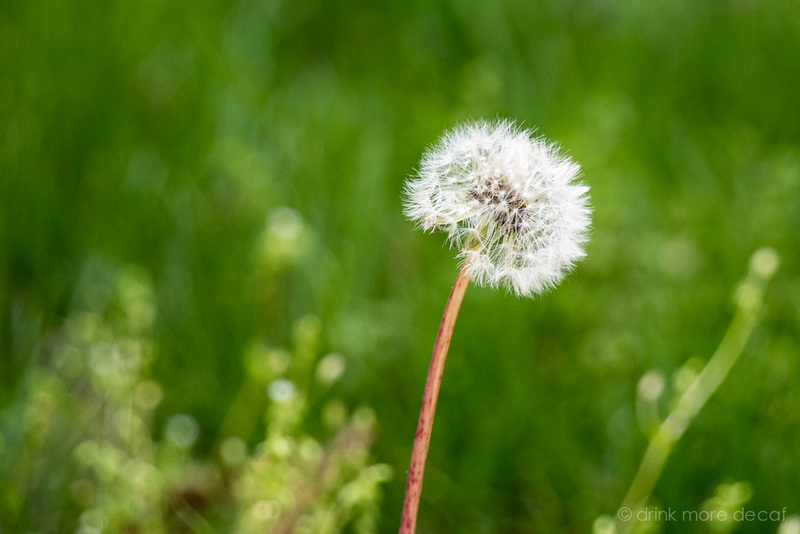 I was on my way to photograph flowers in bloom in our yard, and did not have my camera settings prepared for an action shot. So this is what they call a “lucky capture”! 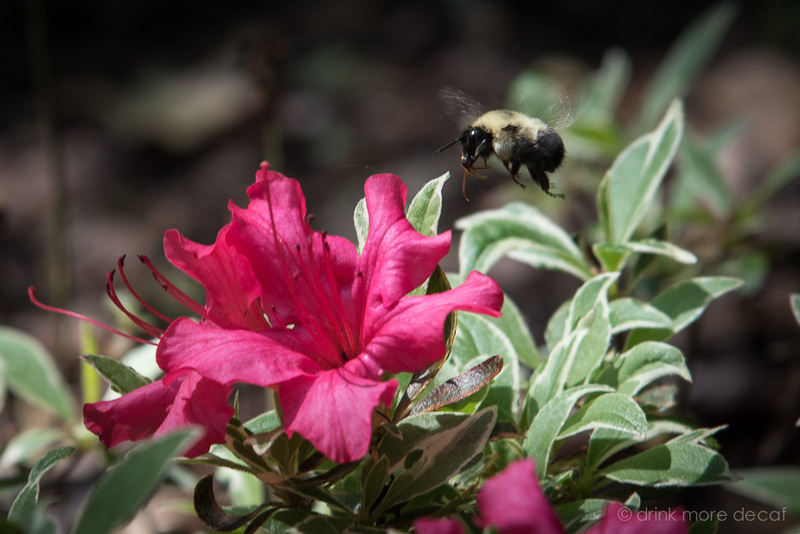 Thank you Mr. Bumblebee for holding still an extra second longer! And I must say, I’m ever grateful for Google Image Search. My intention today was Flower-Indentification – and I did it! 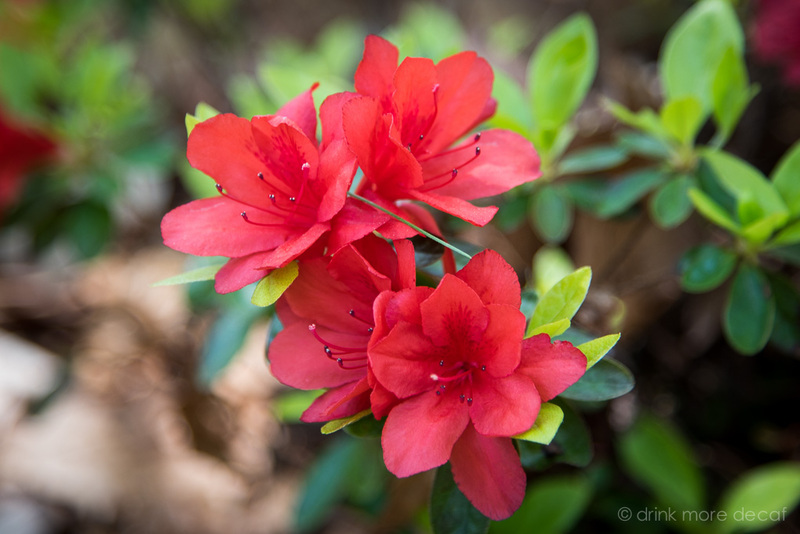 Today I learned, these flowers are Azaleas! The pink ones above aren’t doing so well and I’m not sure why exactly, but the red ones below are quite healthy and happy. Many years ago now (at least it seems that way), I developed an allergy to corn. Because of how pervasive corn-derived ingredients are in the United States it took us somewhere between 6-9 months to learn what living corn-free REALLY means. It felt overwhelming and difficult. It felt crazy. 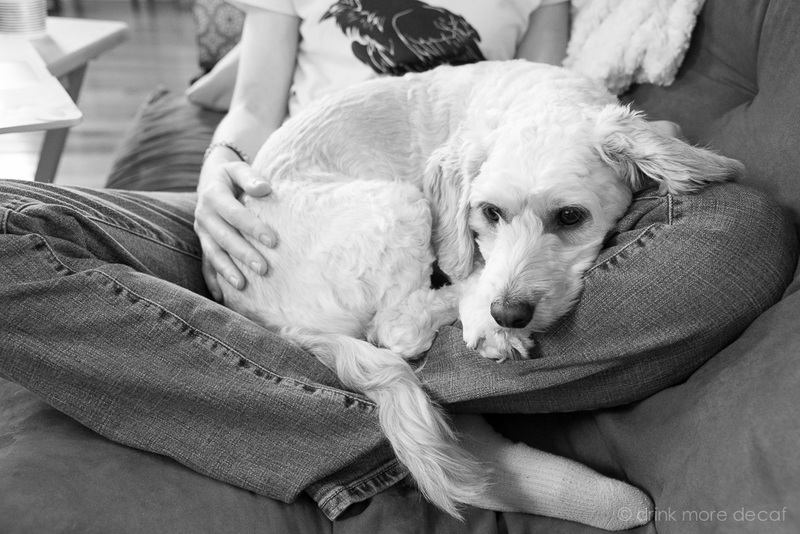 It was in a word – exhausting. As a family, we had to overhaul everything we thought of as normal. Since then, I’ve had health issues that also challenged “our version of normal” and forced us to take a look at our lifestyle yet again. What and how were we eating. What about exercise? And how was stress being handled? So yes, more changes were made. But each time we did what we thought was necessary at the time, it felt overwhelming and exhausting, and we created a new version of normal. The other day I fell down the rabbit hole of research again and discovered I had fallen into complacency. Though I read ingredients on everything I use, I have become accustomed to ingredient lists that include items that are “safe” for me because they are not corn-derived, but I stopped asking questions beyond corn. After investigating for corn-derivatives, I didn’t ask – what is this? What is it made from? How is it made? And most importantly, is this safe for my health? I intend to live a long, happy, healthy life. But I am in charge of, and responsible for my own health, and it’s time to stop riding in the passenger seat and get back behind the wheel. Personally, I feel there is a lot we can do to “prevent” cancer. 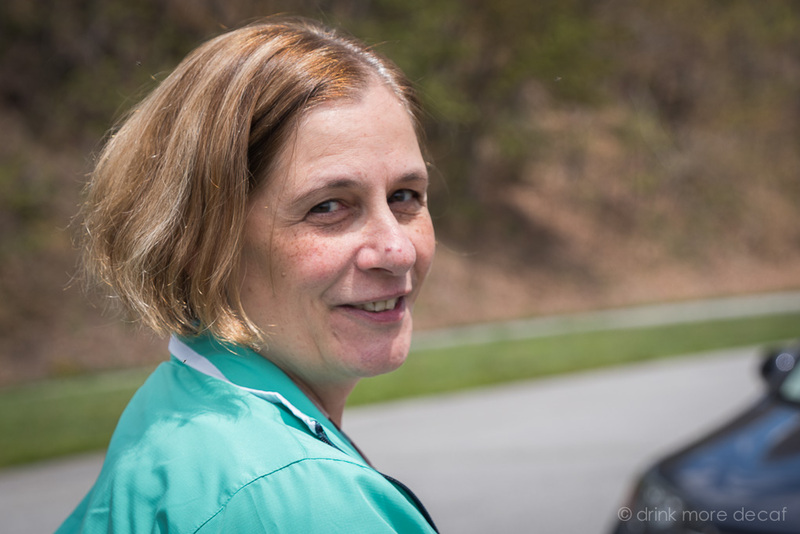 I’m not talking about early detection screenings – I’m talking about true, actual, prevention. Eating well, and living a healthy lifestyle can really go a far way into providing good health. My diet is overhauled and re-evaluated on a constant basis (for a variety of reasons) and I’m happy to say I’m back into strength-training (that’s a topic for another day, I’m sure I’ll talk about that soon). Strength-training makes me happy and I’m very glad I have finally been able to get back into the groove after a very long break. But my environment has room for improvement. My lack of knowledge about sunscreen made that glaringly obvious. I’m upset with myself for allowing myself to be ignorant for so long. So… I’m on a quest to Reduce My Toxins. Essentially, I will be looking at a variety of personal care products such as soap, shampoo, toothpaste, lotions, household cleaners, etc, and drive down the source of every single ingredient and determine if I want to continue to use that product, or find a safer alternative. I’m not going to just let my eyes glaze over at word recognition in an ingredient list without knowing for sure, what that ingredient does, and what it’s possible effects are on my health. Each single item will probably take me a week to research so this will be an ongoing project that could last as long as a year, but one I think worth doing. I’m ready to create a new version of normal. I will still be blogging here (on Drink More Decaf) about life in general, the new site is just a way to give my research a home. I could never find my notes in Google Docs! Anyway, if you choose to check out my “research” site, I hope you find it helpful! All SPF is good, right? Well, it depends. Are you concerned about the chemicals in your sunscreen product passing through to your breast milk? Would it concern you to know if they turn up in your blood, or urine? Are you attempting to prevent skin cancer? As a consumer, you need a little bit of information before you buy. The chemicals that provide SPF in daily products such as lotions, and makeup are not created equal. The sunscreen chemicals do not all behave the same way – I didn’t realize this, did you? Here are some basics… There are two types of sunscreen: Physical, and Chemical. Let me explain what that means. Physical Sunscreen: These sunscreen elements protect your skin by reflecting and scattering the UV rays. These include Zinc Oxide, and Titanium Dioxide. These work by acting like a shield for your skin, and do not absorb into your body. Chemical Sunscreen: These sunscreen elements work by absorbing the suns rays. They also absorb into your skin instead of sitting on your skin’s surface. Chemical sunscreens include; Oxybenzone, Octinoxate, Homosalate, Octisalate, Octocrylene, Avobenzone. There are more that are approved by the FDA, though they are rarely used. The first ingredient, Ensulizole (Phenylbenzimidazole Sulfonic Acid or PBSA), causes the formation of free radicals, and may cause cancer – and, can be detected in human breast milk and urine. You can read more about this here. The second ingredient, Octinoxate has been shown to have hormone-mimicking effects when tested on laboratory animals (it’s an endocrine disruptor), and this too has been found in mother’s milk samples. You can read more about this here and here. 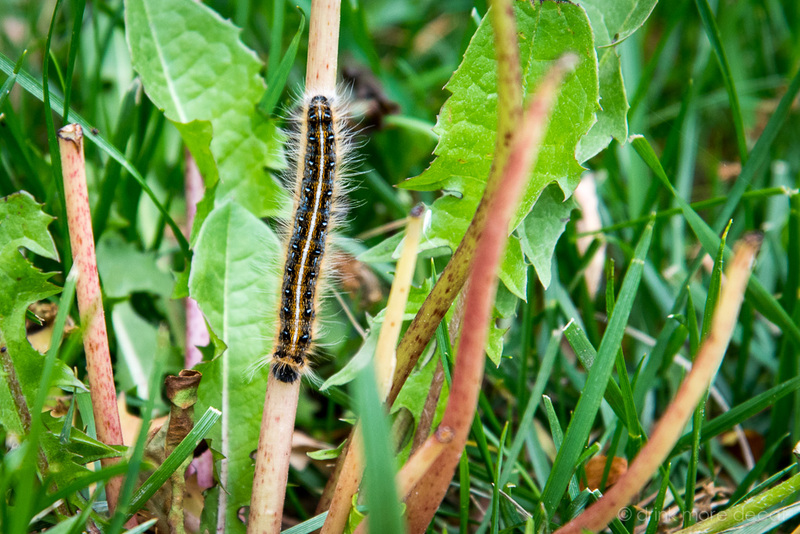 Moving on… we now see Octisalate. In order to research Octisalate accurately, it would be best to do research under ALL of it’s known names since scientific studies may reference it by one name and not another. This site lists it’s known synonyms. 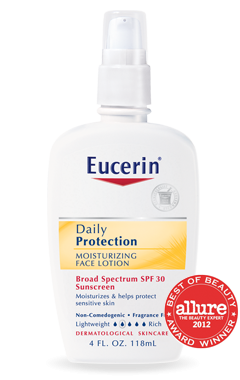 The last two active ingredients in this Eucerin product are Titanium Dioxide and Zinc Oxide, which are physical blockers. Zinc Oxide as a physical blocker is photostable so it’s properties are not altered when exposed to sunlight. Keep in mind, there are many sunscreen products that ONLY contain physical blockers without including chemical ones, and those may be better choices. And though I selected this one particular product to use as an example, these ingredients are found in hundreds of personal care products. Yes, even those “trustworthy” companies use them, such as Eucerin, Aveeno, and Neutrogena. However, as a consumer, you have choices. One more thing. When it comes to Zinc Oxide other things to keep in mind are nano vs. non-nano. Confused yet? The term non-nano is not FDA regulated, so it is important to keep that in mind. Badger Balm does a great job of explaining the non-nano issue on their website here. To wrap up, not all sunscreens are created equal. This post was created with family and friends in mind, and is not intended to be an all-inclusive thesis. I am just another person who wants to be an informed consumer and make the safest choices for my health and my family. You are encouraged to question what you read, where you read it, and research ingredients that you apply to your body as you see fit. If these things do not concern you, by all means, carry on! Unless you scuba dive. If you scuba dive, please be aware that the chemicals you place on your body are being shared with the fish! You can read more about that here and here. If you’re going to just read one link here, read this one: Everything you ever wanted to know about sunscreen. A 2014 Chemical Sunscreen chart by EWG. Note: not all chemical sunscreens are listed.